Virat Kohli added another record in his Test Career as he hit his maiden double hundred, in any format and at any level. 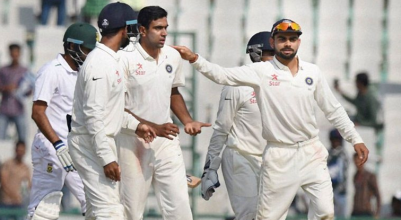 In Day 2 of first test match, India started with 302/4 having Kohli & R Ashwin batting. Virat Kohli fell shortly after scoring his first ever double hundred as the Indian Test skipper was dismissed by Gabriel first ball after Lunch. Batting on 200, Kohli was bowled by the seamer. As they failed to create chances with the new ball, West Indies looked tired a lot in the morning session. While the focus remained on Kohli, Ashwin quietly went about doing business as he scored a crucial fifty, and then a hundred, in the process. He also shared a record 168-run fifth-wicket stand with the skipper at this venue. Celebrations were in plenty and the fans applaud for their efforts. Kumble was out with his camera while Viv Richards was all smiles from the stands. Former India captain Sunil Gavaskar was very pleased from the commentary box. After declaring at 566/8, India reduced hosts to 31/1 at stumps.